Acoustic Imaging System is the easiest and fast way to visualize and measure the noise sources. The acoustic imaging system from our principals are their patented technology which aims at simplified user interface and greater accuracy. It can be used as a quality diagnostic tool to quickly identify the problem or as a R&D tool to enhance the performance of the product. We Offer Compact Acoustic Holography, Real Time Holography and Large Array Holography systems. The Acoustic Camera was the first commercially viable system using beamforming to visually localize acoustic emissions. The tool is now used in a variety of industries and has a growing customer base worldwide. The advantage of the Acoustic Camera: it is a light-weight, modular and therefore flexible system which is rapidly set up and ready to use. After a few minutes only, you get the first acoustic images on your computer screen. The software allows a clear, exact and fast analysis of noise sources. The fields of application are as various as the world of sound and range from measurements in the open field, acoustic labs to the use in automation engineering. The benefits of the Acoustic Camera are straightforward: Noise sources are visualized, quality problems are detected and development times are reduced. Analysis of cracking, clicking and other noises, wind noise. 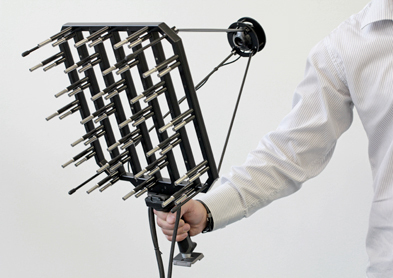 This data-recording device has been developed especially for use with the acoustic camera. NoiseImage enables the user to freely choose and display a variety of analyses simultaneously: time-, frequency-, rpm- and space-selective.